Different real estate markets have advantages over others, whether it’s higher cash flow, renter stability or long-term appreciation. Some hit the sweet spot between entry price and market rent, while others might be poised for an uptick thanks to new business development or population growth. Whatever your budget and investing goals, expanding your search for the right property will help diversify your portfolio and maximize potential returns. That’s where our partner, Roofstock, can help. They’ve made it easier than ever to purchase turnkey, cash-flowing investment properties in a range of strong U.S. rental markets—no matter where you live. It’s the perfect combination of exciting new investment opportunities, all with our property management services that you’re used to. How does Roofstock help rental property investors? 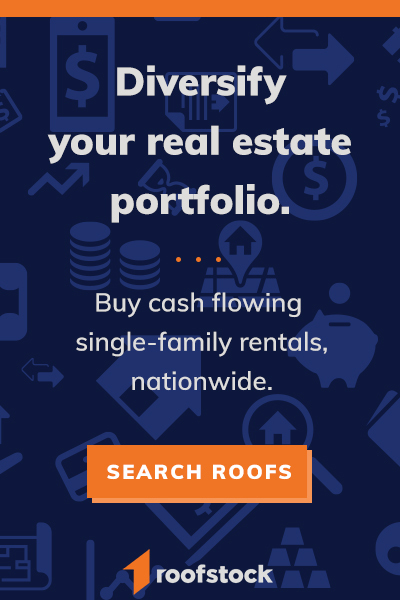 Roofstock is the first online marketplace created exclusively for buyers and sellers of single-family rental homes that already have tenants. Their transparent, intuitive platform offers detailed home and tenant information, analytics and market insights, as well as the industry’s first-ever single-family rental ratings index for U.S. neighborhoods that assesses neighborhood-specific risk. All of Roofstock’s certified properties are inspected in person and come with a 30-day, Money-Back Guarantee. Their marketplace brings quality investment properties from around the country under one roof, allowing investors to transact 100% online from browsing to closing. Buy your next investment property from the comfort of your home with Roofstock. Considering selling a rental property? Roofstock’s investor-focused marketplace can help with that as well. By allowing you to sell your rental with a tenant-in-place and listing it on a marketplace that caters to rental investors across the country, you can earn more on the sale of your occupied property by saving on lost rent, reduced commission, fees and renovation costs. Learn more about a better way to sell your rental.